The Anton-Paar DMA-35 is a handheld, stand-alone digital density meter suitable for use in demanding industrial environments. Measuring specific gravity and electrolyte temperature has always been a time consuming, messy chore requiring two technicians: one to take the readings, the other to write down the data. Now, one technician can both measure specific gravity and temperature and record the data more quickly than with other conventional methods. 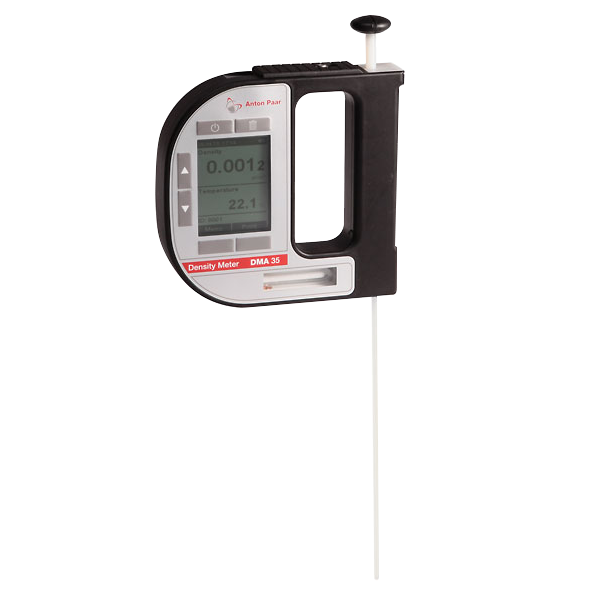 Simply press a lever and, within seconds, the temperature, density, specific gravity, or percent concentration of the sample is displayed. To save the data, press a button; up to 1,024 data points may be stored in the instrument. Weighing in at 10 ounces, the DMA-35 digital hydrometer won’t tire you out, no matter how many samples you must measure. And the DMA-35 delivers up to 90 hours of service on two alkaline 1.5 volt AAA batteries. The DMA35-CRT includes a CRT module used for data transfer to an Alber Cellcorder. It includes both an infrared interface for communication with the new CRT-400 and CRT-300 Cellcorders and a serial interface for a PC or the CLC-200. PC software is included with this model. The DMA-35 with data logging interface stores up to eight strings of readings (256 readings per string) of specific gravity and acid temperature and download s formatted data to a Cellcorder or a PC for use with the Alber Battery Analysis Software. Measure and record SGU/Temp in less than 5 seconds. One hand operation – physical dimensions, 5.5” x 5.4” x 1” and weight of only 13 ounces. Automatically compensates the specific gravity for fluid temperature. If required, all moving parts are field replaceable by the user in 5 seconds..
Can be used on all manufacturers “wet” cells through corner withdrawal tubes or vent caps. The DMA35-CRT includes a CRT module used for data transfer to a PC or an Alber Cellcorder. It includes both an infrared interface for communication with the new CRT-400 and CRT-300 Cellcorders and a serial interface for a PC or the CLC-200. PC software is included with this model.